Formula Vee is sad to report that Air racing competitor Charlie Terry of Long Island New York has passed away. 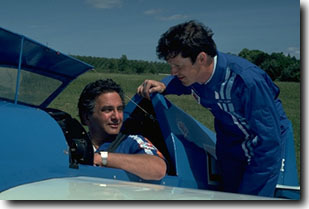 He competed in International Formula One Air Racing and Formula Vee Air Racing over several decades. He won the F/V National Championship in 1985 and came close several other times. He competed in the first F/V race and the last F/V race and competed in almost all the rest thru the decades. He was F/V president for several years and certainly was an asset to air racing and kept F/V going thru some very trying times. He always seemed to have a positive outlook, even when all was bleak. He seemed larger than life with his explosive personality, and his enthusiasm was contagious. Some people had ups and downs with him, but most people stood behind him with his great ideas towards air racing. He would enthusiastically help the competition to make it to a race even if it meant traveling half way across the country and incurring personal setbacks to keep the class going and improving. His unselfish total commitment to F/V will never be forgotten. Formula Vee's condolences go out to his family and many friends. Have a good flight west Charlie.........You will be missed. Entire contents © copyright 1996-2012 Formula V Air Racing Association, Inc. All Rights Reserved.